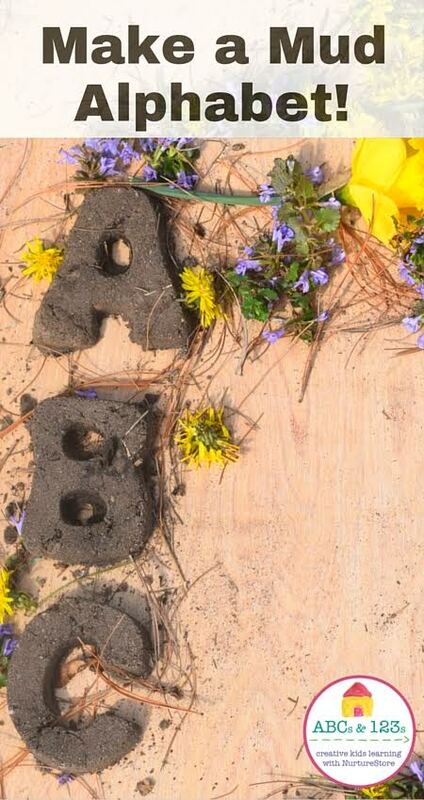 Please welcome Nicolette from Wilder Child who bring a glorious mud alphabet to our ABCs and 123s series today. Although she loves our read aloud time, my three year old hasn’t shown much interest in expanding on her knowledge of the alphabet, creating words or sounding them out. I thought by providing her with an activity that was more sensory and play-based, she might enjoy it more. There wasn’t any pressure either way (she’s moving at her own pace), but I thought it might be fun to experiment with making a mud alphabet! These were originally for making alphabet soap, but of course I never got around to that. You don’t really need these, you can just make letters with your hands. Here are the forms I used, and here are some alternatives on Amazon. Whether you need flour or not will depend on your soil type. This is what you will use to fill the alphabet forms (if you decide to use them). Mix the dirt and water together to make mud. I had to add some flour to mine to get it to stick together a bit more, but if you have clay in your soil it should be perfect. 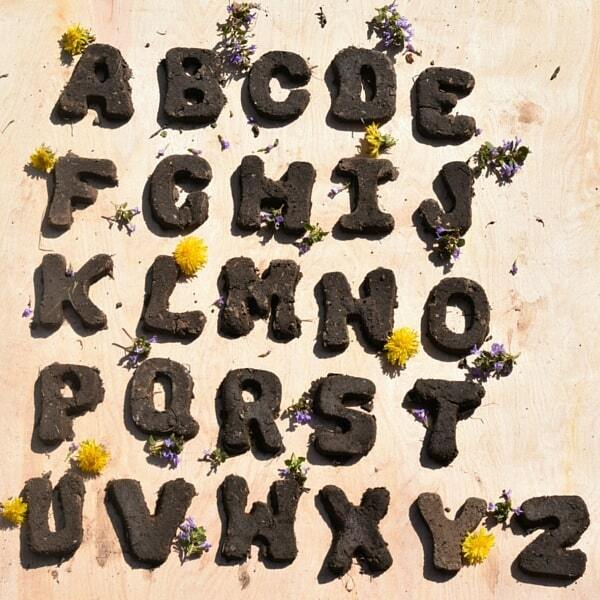 Fill the alphabet forms with your mud and pop them out onto the ground or other surface. I did this step without my daughter because the letters can be frustrating to get out of the forms for little hands. To include your kids on this step, just skip the forms and instead encourage them to use the mud to shape letters with their hands. Give them a basket and send them off to collect natural materials that they are attracted to (sand, flowers, leaves etc.). This part is completely optional, I don’t suggest pushing this unless your kids show an interest. My daughter wanted to spell out and decorate her name and “house” so we did. I have never seen my daughter more engaged in the alphabet than with this activity, and I hope your kids will have as much fun as we did! Nicolette Sowder has a passion for all things wild. As a mother, farmer in training and former teacher, she has worked with kids and their parents to reconnect with nature and get back outside. 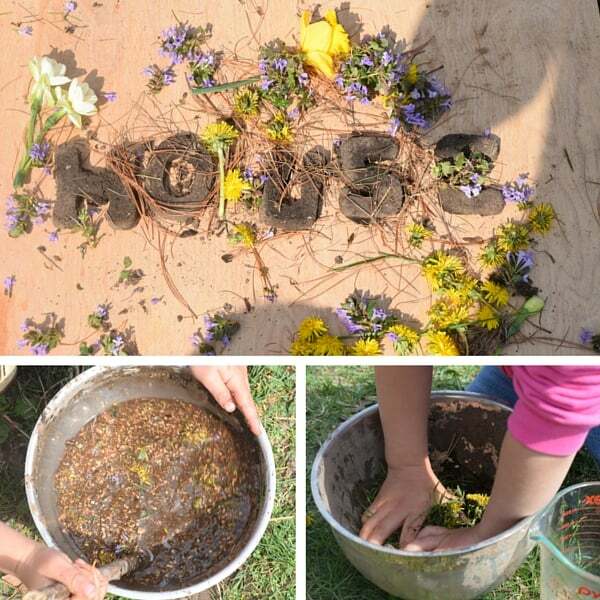 She shares thoughts, play-based ideas and nature-based inspiration at Wilder Child.